We mentioned a few weeks ago that we have gone back to the Keep It Simple line of thinking for some of our notes by using Simplenote. An app that allows for simple notes that sync through the Simplenote’s servers, has nice taging or pinning to move items to the top of the list. It is great for jotting down notes that are more than Todo items but less than a full NoteTaker note. An email just came in from Jesse who does TaskPaper (which we have reviewed earlier) announcing his KISS style notes app: PlainText. He has added a few handy features beyond just allowing for plain text notes but keeping it simple and fast to use. While keeping the universal app free. 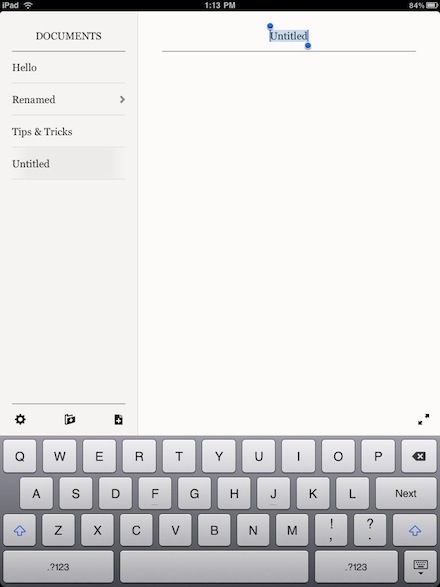 The two big items that make this text note app stand out from most of the other simple notes app is the ability to add folders and syncing with your Dropbox acct. 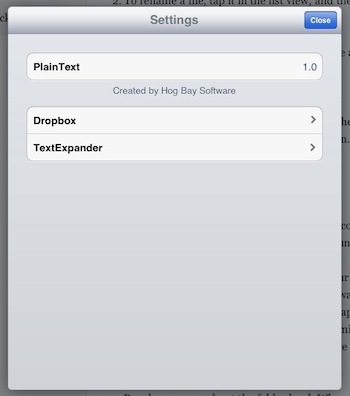 Settings allow to turn on TextExpander and to enter the login/pass for your free DropBox acct. 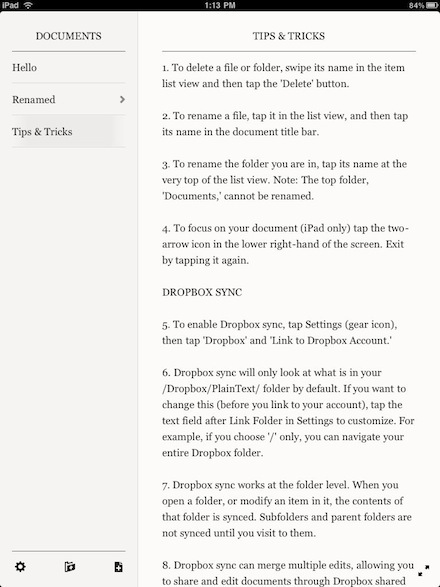 The notes on your DropBox account can be edited with your usual desktop notes software. 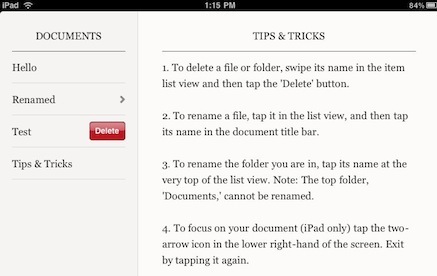 Any note or folder can be renamed by tapping the text at the top of note or the folder name on the left list. Swiping a note name in PlainText gives you the option to deleting. You can add as many notes in a folder as you need. 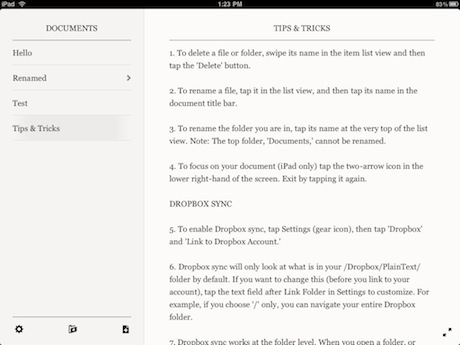 Creating notes and creating folders are done via the buttons at the bottom of the page. You can not currently move a note from one folder to another. Tapping the folder name ‘RENAMED’ will allow you to change the name or tap the arrow to move up a layer to the overall notes folders area. The lower right corner of the screen has two arrows that makes the note full screen. As seen here, there is little difference between the landscape and portrait view. The PlainText app is currently free and appears to continue to be free. While we have not seen any ads yet, the near future plan is for ads to appear with the in-app option to pay to have them go away.